A researcher from Lund University in Sweden has managed to install a huge curtain in a remote cloud forest in South America. The aim is to study how these valuable forests are affected if clouds are elevated due to global warming. The world’s cloud forests are facing the threat of rapid climate change, as global warming may lead to clouds being pushed higher up in the sky. If the lowest level of clouds, known as the cloud base, is raised, it could have a major impact on these forests. However, so far we know very little about how climate change could affect the structure and function of rainforests. Therefore, Dan Metcalfe has now launched an eye-catching project in an area of Peru called Wayqecha. The giant curtain out in the Peruvian wild jungle is 30 meters high and 40 metres wide, and made of plastic mesh. The curtain screens off a small area of the forest. Damp fog in the mountain slope then condenses against the curtain, causing the forest on the other side to be exposed to a much drier microclimate than usual. The drier conditions are precisely what Metcalfe is now keenly observing. “The aim is to provide, for the first time, a picture of how a reduced amount of clouds in a cloud forest can affect its biodiversity and ability to store carbon”, says Dan Metcalfe, physical geographer at Lund University. 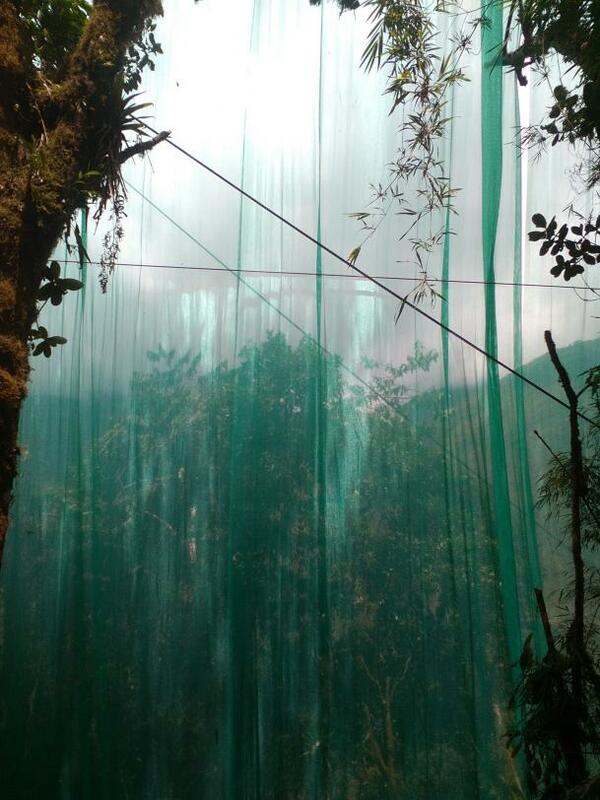 On a wild mountain slope of the Peruvian jungle, researcher Dan Metcalfe has strung up his huge plastic curtain. Cloud forests are a natural environment found in mainly tropical mountain areas at 500–4 000 metres above sea level. They are characterised as being constantly embedded in the damp fog of clouds. According to current climate models, global warming will reduce the amount of low clouds, which means that low-lying cloud forests are particularly at risk. Although the forests represent only a few per cent of all tropical forests, this type of forest is of great value. “Cloud forests are home to an unusually large number of unique species, both plants and animals. They also provide key ecosystem services”, says Dan Metcalfe. For example, the forests serve as an important freshwater reservoir thanks to the vast proportion of mosses and lichens they contain. The mosses and lichens are particularly good at retaining water, which allows the forest as a whole to regulate the water flow not only in nearby valleys but also in more remote lowlands. Another ecosystem service the forests provide is carbon storage, as they absorb carbon compounds from the air and store them in the growing vegetation. Getting the enormous curtain in place in the remote rainforest was not an easy task for Dan Metcalfe. It became a drawn-out struggle for several years. “The project has involved a great number of challenges”, says Dan Metcalfe. Among the most fundamental difficulties was to come up with a suitable design for the curtain and its installation, and to find an engineer who could install the entire apparatus in such a remote and extreme environment. Metcalfe was partly able to take advantage of existing steel scaffolding belonging to a nearby research station, but all other equipment had to be carried into the area. The large curtain in the forest of Wayqecha could be of use to many different research areas such as ecology and the environment, but also meteorology and hydrology. Dan Metcalfe therefore hopes that more researchers will take the opportunity to utilise the experimental curtain. “Anyone who has ideas on how to use the curtain for their own research studies can contact me”, he says.